I am one of those people that is highly sceptical of anything that promises to get rid of your spots. From experience very little actually delivers on that promise and I've spend so much money trying different things with little success. However, there are two products I've discovered that I always go to when my skin decides to play up. What rebellious skin I have! Both of these are treatments, so an addition to your cleanse, tone and moisturise routine. I use either one of these, depending on my mood, after toning and before moisturising. 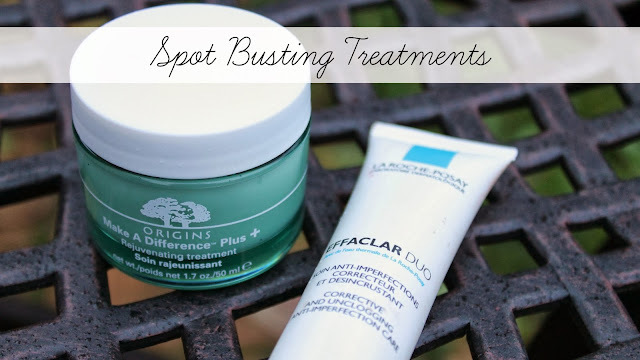 La Roche Posay Effaclar Duo is the first of the two that I tried. Very gel like in consistency I've found this is really good at calming redness and spots down, reducing them. It's quite drying so tends to dehydrate the spots so I guess that's why they shrink. The second of the two is the Origins Make a Difference Plus + which is amazing when you're having just really bad skin weeks. It just clears the skin up and keeps them at bay. Whereas the Effaclar Duo is good at diffusing them once they are here, the Make A Difference Plus + is good at keeping them away. I use this most days and then the Effaclar Duo for days when the Origins is losing it's battle against my naughty skin. Either of these two is definitely worth getting. Effaclar Duo I would recommend if you're one a bit of a budget, however if you want to dish out a bit more then grab the Make a Difference Plus+ as it's definitely worth it. What spot busters work for you?